In the 1860s it was common for schools to be built and developed by private individuals. Opened in 1862, what is now the centre of the Church Hall was built as the location of ‘St David’s and Yasmar Sabbath School ’. It is the second oldest building in Haberfield (after the Yasmar Estate on Parramatta Road ). Additions were made (the red-brick ‘H’ wings) to each end of the Hall in 1930. They feature the pointed Gothic windows to complement the original structure. 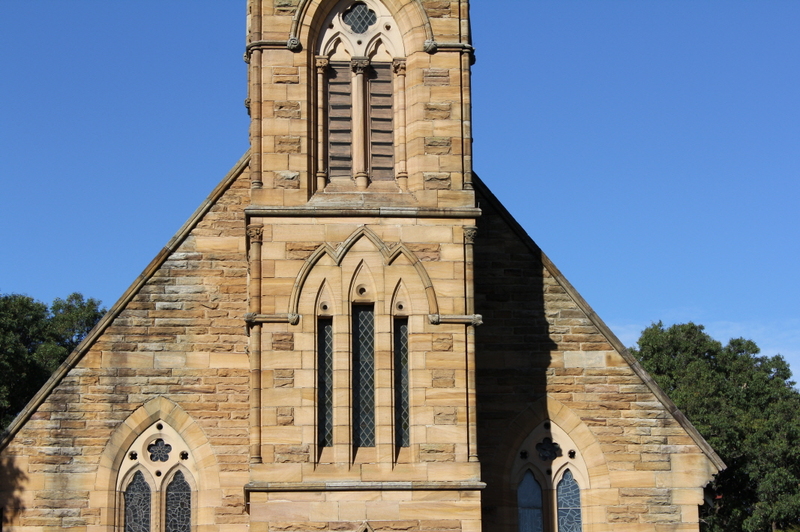 The church was designed by Thomas Rowe (also the designer of the Sydney Hospital and the Great Synagogue), and combines the Gothic Revival Style with a square Norman style tower. Key features of the Gothic style are the pointed arch windows and the buttresses, which are also a feature of the original Hall. Originally the tower included a tall spire, but after a lightning strike in a 1920 thunderstorm it became too dangerous and had to be dismantled. The inside of the church reflects a mix of styles and traditions, including Gothic features and characteristics of Presbyterian approaches to church architecture. There are pointed stained glass windows and a double aisle (rather than one central aisle), meaning that the ‘crucifix style’ of many Gothic churches is absent. In line with Presbyterian theology, the front wall is plain and adorned only with an empty cross, and under the cross sits the Communion Table. It is flanked by a number of chairs, reflecting the prominent place of the Elders. Balancing the central place of the Communion table is a large raised pulpit, which conveys the importance of the preaching of the Word of God. The Manse ( 53 Dalhousie St ) was built as the Minister’s residence in 1911, at around the time that the suburb of Haberfield was being rapidly developed after Federation. It is of Federation style, though with some ‘ecclesiastical’ features added. The top of the front window is in the shape of a pointed Gothic arch, providing a link with St David’s itself. The verandah fretwork and the gable contain a trefoil motif symbolising the Holy Trinity. The front fence of wrought iron with a brick base is typical of the Federation period and thus of Haberfield. It clearly defines the property boundary yet does not obstruct the view, both of the house and the garden. The grounds on which the church stands formed part of an original grant of land to Ensign Nicholas Bayley in 1803, as was known as The Dobroyde Estate. The land was sold to Simeon Lord, and given as a dowry to his daughter Sarah Ann on her marriage to Dr David Ramsay. The Ramsays built a school known as Yasmar (Ramsay spelt backwards) – the current church hall. Services were held in the building on Sundays. The present Yasmar house nearby was originally the home of Ramsay daughter, Mary Louisa, and her husband, Alex Learmonth, who was superintendent of the Sunday School. The first public worship was conducted by Rev Dr John Dunmore Lang on 6 th May, 1866 . The Rev MacKenzie became the first pastor of the church, which was known at the time as ‘St David’s Presbyterian Church Ashfield’. 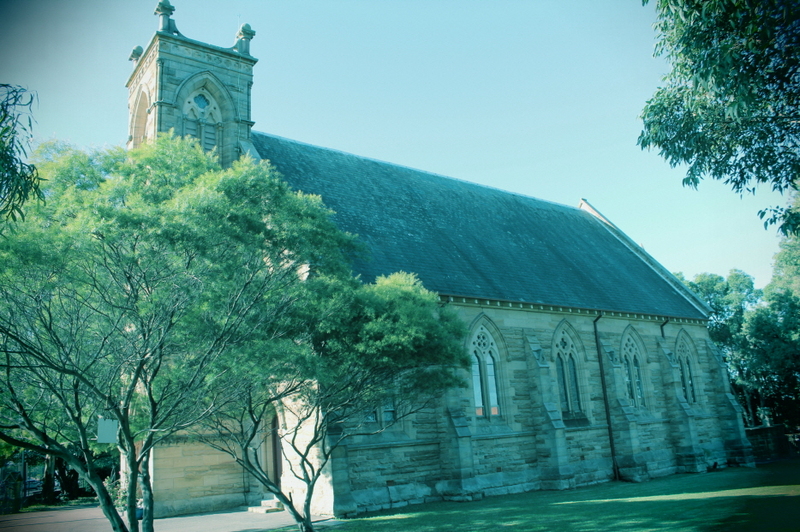 (At the time the suburb of Haberfield did not exist) Finance for a church was gained by subscription, with the Ramsay family donating 4 acres of land on which the church, hall and manse currently stand. The foundation stone was laid by Sarah Ramsay on 28 th April 1868 . This was to have been carried out by HRH Alfred, Duke of Edinburgh, but an attempt on his life at Clontarf prevented him from attending. The church was designed by Thomas Rowe. 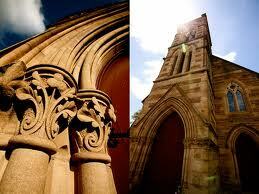 The church was opened on Good Friday, 26 th March 1869 , with the Duke of Edinburgh this time being in attendance. The manse was constructed at a then cost of £1100. The organ was installed in memory of those who served in the First World War. The organ was electrified, and the pipes were moved to the back of the church. St David’s became part of the Uniting Church in Australia , which was a union of the Congregational, Methodist and Presbyterian Churches .